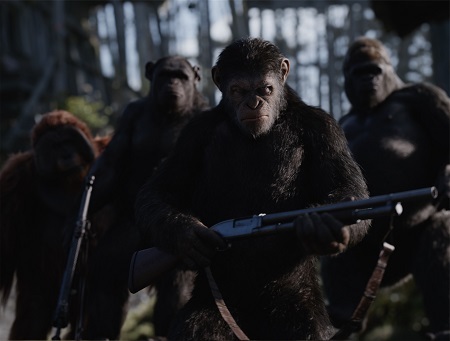 After his attempts to make peace with the surviving humans was undermined by his most trusted friend Koba (Toby Kebbell), Caesar (Andy Serkis) has moved his large contingent of apes even deeper into the forest. But soldiers, now led by a driven Colonel (Woody Harrelson) who wishes to see the primate leader dead, are getting closer and closer to finding their secret location. Not wanting to see any more bloodshed on either side of the conflict, Caesar plans to take his followers through a desolate wasteland of rock and sand to a lush utopia hidden on the other side of this expanse, well away from any remaining pockets of human civilization. But before he can, the Colonel leads a daring raid into their current cliffside hideaway, the tragedy that ensues beyond imagining. Caesar, believing the only way the apes can escape is for him to lead the soldiers in the opposite direction, decides to go after the Colonel on his own. While the majority reluctantly follow his order, a small cadre of friends and advisers join him in his pursuit, all of them attempting to make the clandestine trek to the human enclave in hopes of ensuring none of these gun-toting fighting men and women will be a threat in the future. What they find, however, is not what they imagined, the Colonel’s battle preparations having precious little to do with Caesar and more to do with an even greater threat that could reduce humanity’s place in society well below that of the increasingly intelligent and self-sufficient apes. Where 2011’s Rise of the Planet of the Apes was a fine modern day extrapolation of the ideas presented in 1968’s Planet of the Apes, and 2014’s Dawn of the Planet of the Apes was an even more stunning continuation of the story, nothing prepared me for just how superb this summer’s War for the Planet of the Apes proved to be. Returning director and co-writer Matt Reeves, along with fellow screenwriter Mark Bomback (The Wolverine), don’t just craft an invigorating and thought-provoking finale to this prequel trilogy, they also tie things directly into the Charlton Heston classic in ways that continually amaze. More, they have constructed a story that asks tough questions about humanity, our place in the world and how we are treating both the Earth as well as those who live upon it that are pointed, well-reasoned and devoid of any simplistic answers. 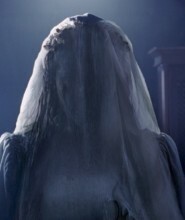 This motion picture is stunning, there’s no other way to put it. Reeves moves things with an organic precision that kept me on the edge of my seat, always questioning what was going to happen next. Caesar’s interior battles as he deals with the emotional repercussions of the Colonel’s assault on his headquarters are deftly handled, his realizations that he’s succumbing to the same sort of hatred that destroyed Koba staggering. Yet, there are the larger implications of what is going on in the world, the way humanity is still changing thanks to the evolving nature of the Simian Flu, all of which and more are also things the ape leader must take into consideration as he hunts his prey. It are these interior struggles that Reeves and Bomback focus on, allowing Caesar a level of complexity that’s breathtaking. He is our eyes and ears into this world that, considering current modern realities, isn’t as far from the truth as we might like to believe. Like the best science fiction, the writers tackle issues in the current zeitgeist and shine a spotlight down upon them some might not initially take note of. But, when they do, topics ranging from racial animus, to gender equality, to income disparity, to environmental awareness are all present, the subtle way in which these ideas are discussed, debated and dealt with reminiscent of the works of Isaac Asimov, Ray Bradbury, Arthur C. Clarke and so many other talented authors. This all gives Serkis, who has been gradually more extraordinary as Caesar one film to the next, even more to play. Make no mistake, motion capture effects or no motion capture effects, this is one of the best performances by an actor a moviegoer is likely going to see this, or in any other, year. The depth of his passion, the emotional responses he conveys, the pain and resilience hinted at in every reverberation of his vocal chords, it’s just masterful, the actor’s eyes so expressive I found myself getting lost within them on more than one occasion. 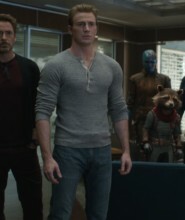 If the Academy keeps refusing to nominate him for Best Actor outright, someone, somewhere in that organization please give this man an honorary Oscar because goodness knows that between this series and his work for Peter Jackson in The Lord of the Rings trilogy and that King Kong remake he sure as heck deserves it. The remainder of the cast is also excellent, especially Harrelson as the psychologically scarred Colonel, driven to extremes because he both feels it is what is best for humanity but also because of his own crippling fear as it pertains to the latest mutation of the Simian Flu. Steve Zahn also makes quite the impression as a new ape who ends up being essential to Caesar’s plans to see his followers survive, while actress Karin Konoval has slowly evolved the resilient, fiercely loyal Maurice into a figure of such intellectual compassion it’s impossible to underestimate the character’s importance on the series as a whole. Then there is young Amiah Miller, of which the less said about the better, the role she plays vital as far as linking this final chapter in the prequel trilogy to the Heston masterpiece they precede. Reeves, a director who made waves by following up his found footage hit Cloverfield with the excellent English language Let the Right One In adaptation Let Me In only to then make an even greater statement with Dawn of the Planet of the Apes four years later, cements his status as one of the more adventurous, confidently purposeful filmmakers working in the Hollywood system today. In a risk adverse atmosphere where studios are loathe to spend hundreds of millions on projects that don’t speak to the widest audience possible and eschew themes that could be construed as depressing or political, somehow he has managed to buck that trend with focused determination. Reeves’s orchestrations are specific, detailed and consistently engaging, his faith that the audience will be willing to follow things wherever they may go, even if that means humanity’s potential destruction, frankly stunning. The technical facets are as strong as ever, and while a climactic set piece involving Nature’s devastating power outside of mankind’s influence is a little over the top, overall there’s not a single misstep to be found. Fueled by Michael Giacchino’s (Spider-Man: Homecoming, The Incredibles) vital, pulse-pounding score, magnificently shot by the legendary Michael Seresin (Angel Heart, Midnight Express), there’s not a facet of this film that comes off as false or insincere. 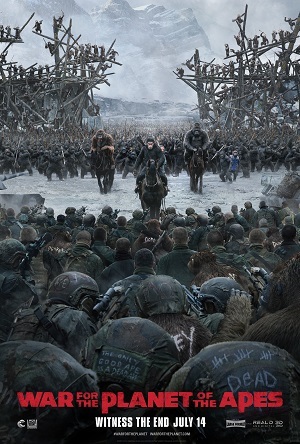 War for the Planet of the Apes is one of the great summertime tentpole adventures in recent memory, Reeves delivering a science fiction epic almost certain to stand the test of time.